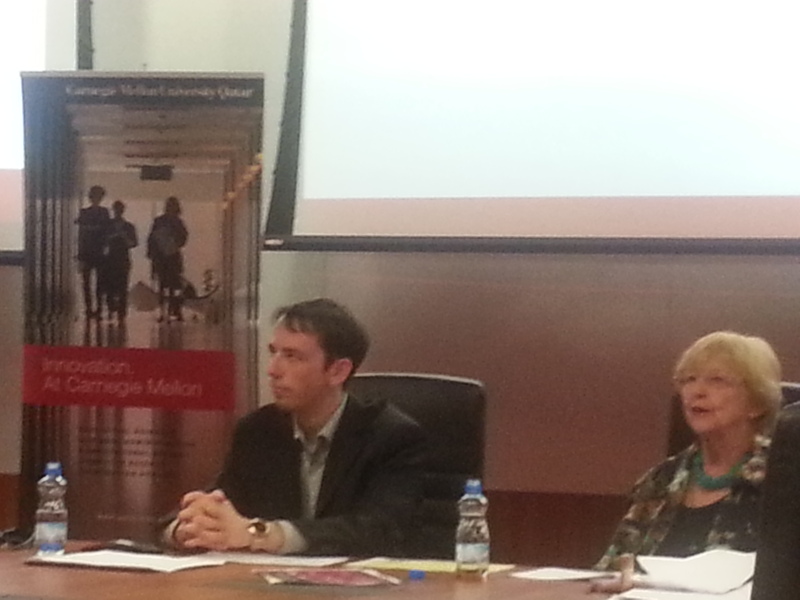 Dr. Gloriana St. Clair*, Dean of Carnegie Mellon University Libraries and Director of the Oliver Archive and Daniel F. Ryan, Curator of Executable Content of the Olive Archive, recently delivered a seminar entitled ‘All knowledge for all people: A progress report’ at Carnegie Mellon University Qatar (CMUQ). On behalf of QScience.com, I attended the event, which was hosted by Teresa McGregor, Director of the Library at CMUQ and Dean of CMUQ, Dr. Ilker Baybars. Dr. St. Clair started her talk by referring to the work of Dr. Raj Reddy, the Moza Bint Nasser University Professor of Computer Science and Robotics in the School of Computer Science at Carnegie Mellon University. She mentioned Dr. Reddy’s vision, in which ‘all the world’s people have all the world’s knowledge’. Part of Dr. Reddy’s work was to establish the Million Book Project (MBP) that aimed to increase the amount of accessible digital book content. In addition to Dr. Reddy, the project was managed Dr. St. Clair, as well as Dr. Jaime Carbonell and Dr. Michael Shamos (Carnegie Mellon University). The MBP recognizes that ‘lifelong learning and access to books have become essential to employment, health, peace, and prosperity”. Having inspired the Google Book Project, the MBP managed to digitize 2 millions books in China, 350,000 books in India and additional books in Egypt and Italy. Although, there is no doubt of the positive impact of book digitization in allowing greater public access to information, digitization initiatives have faced several legal problems with respect to copyright and fair use. For instance, several lawsuits were filed against Google and the HathiTrust Digital Library—a large-scale digital content repository. Dr. St. Clair explained how the law has not kept up with generational demands and how technological developments and amendments need to be made with the public’s interests in mind. Dr. St. Clair continued her talk by showcasing the recent achievements of the Heritage Library Digitization Pilot (HLDP), a collaboration between the Qatar Heritage Library and CMUQ. The project was launched in 2007 and aims to scan 5,000 books and 300 rare books in Arabic, English, as well as other European languages. Some of the titles that have been successfully digitized by the HLCP include Pedro de Alcalá’s Arte para ligeramente saber la lengua arauiga and David Roberts’ Egypt and Nubia, as well as rare copies of the Holy Qu’ran. Daniel F. Ryan then presented the Olive Archive, a digital repository of executable content that includes software, games and simulation models. Ryan talked about the current difficulty faced when attempting to retrieve some of the first designed executable content and thus the need to preserve executable content for future generations. Within the Olive Archive, reservation of content is not dependent upon preservation of old or obsoletes hardware, thus ensuring accessibility with continuous technological advancements and evolution of hardware. In a world where more people spend time using their computers, smartphones, and e-book readers than they do sitting in their local libraries, there is definitely the need to adapt information to today’s consumers’ needs. Book digitization (and executable content preservation) should not only be regarded as a means of preserving our intellectual and culture heritage but also as a way of insuring the robustness of education. This is especially relevant to communities that would not normally have access to hard copies of books. However, I wonder after attending this seminar, is a digitization initiative enough? Should there be a simultaneous push for having more freely accessible books online and eliminating barriers to entry? A utopian literary world would allow unrestricted access to all education references and textbooks. This is all not to mention that the ability to play the original Tetris in the year 2085 wouldn’t be so bad either. *Dr. St. Clair was appointed lecturer at Carnegie Mellon University Qatar. This entry was posted in Qscience. on the road and tagged Carnegie Mellon, Open Access. Bookmark the permalink.